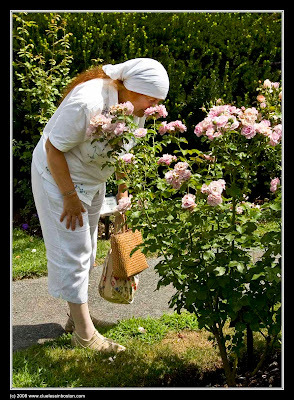 Woman spotted smelling the roses in the Kelleher Rose Garden. Originally established in 1930 and well-hidden inside the Back Bay Fens, the James P. Kelleher Rose Garden has over 200 varieties of roses, more specifically tea, floribunda and grandiflora hybrids. I love italians - they are so full of lofe and other thoughts!!!! This is a wonderful picture... she looks like she's enjoying herself. And to live where there's a rose garden... ah bliss. Makes me want to go home.